Tourism Ireland has reached one million fans on Facebook around the world, making it the third most popular tourism board, after Australia and Spain, on the popular social networking site. Tourism Ireland has doubled its Facebook fanbase in the past twelve months – from 500,000 fans this time last year – and from just 81,000 fans in 2010. Reaching one million Facebook fans is significant because each fan has an average of 200 friends – so Tourism Ireland is just one click away from having its message shared with 200 million people. · a fun “How Irish are you?” competition on Tourism Ireland’s Facebook page in theUS, targeting the Diaspora as part of ‘The Gathering Ireland’ promotions, with a series of questions such as “do you know what hurling is?”, “do you know how to kiss the Blarney Stone?” or “have you read any James Joyce?”. Answers determine if the respondents are truly Irish and offer them a chance to win a trip to Ireland in 2013! 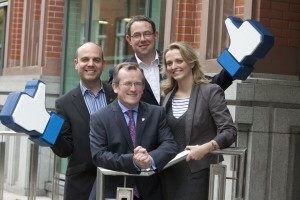 Niall Gibbons (front), Mark Henry, Brian Harte, and Sarah Fitzpatrick, all Tourism Ireland, at the announcement that Tourism Ireland now has one million fans on Facebook. · an “Escape the Madness” Olympics campaign this summer, which created lively conversations about the island of Ireland on Facebook and Twitter in GB, presenting Ireland as the ideal “escape” destination during that hectic time in London. · a campaign in India around the release of Bollywood blockbuster Ek Tha Tiger, which highlighted the island of Ireland as a wonderful holiday destination and a romantic and exotic destination for Indian travellers where the film’s characters Zoya and Tiger (played by Katrina and Salman) meet and fall in love. As part of its overall marketing strategy, Tourism Ireland is using social media to inspire potential holidaymakers to come and visit the island of Ireland. Given that word of mouth is increasingly carried online, Tourism Ireland is working hard to grow the online tourism conversation about Ireland around the world and to stimulate positive word of mouth online about holidays here. For 2013, Tourism Ireland is calling on those people working in the tourism business right around the island of Ireland to share their stories and images with the organisation, so that these will then be shared with the one million fans – and their friends – around the globe.